'Aaj Ki Raat Hai Zindagi' is upcoming Hindi Entertainment Show on Star Plus . Title of the Show is Officially Announced but the Casting for the show is begun.This show is produced by Star India. 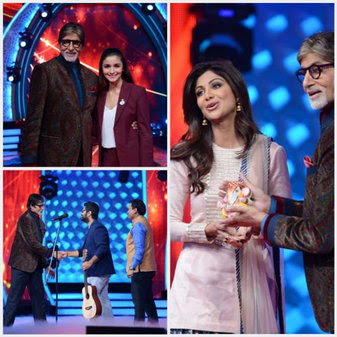 Bollywood superstar Amitabh Bachchan, who began his career on television 15 years ago with the Star Plus show ‘Kaun Banega Crorepati’ (KBC), is once again joining hands with the channel for a new show titled ‘Aaj Ki Raat Hai Zindagi’. The 72-year-old is likely to be seen in a "never-seen-before" avatar. They have come together to "once more change the grammar of creativity and entertain and inspire a nation"
“Aaj Ki Raat Hai Zindagi” celebrates uncommon people’s kindness towards society and will showcase the journeys of people, who went against all odds to help the society improve and worked as an inspiration for others to change their outlook. In the first promo of the show, Bachchan is seen making a dull elevator ride interesting by breaking into an impromptu gig. He dances and prances around in the elevator in a tracksuit with foot-tapping beats in the background.